54" Extreme Color? dazzling photo-realistic images printed on a variety of media, including self-adhesive Vinyl Film, Glossy Paper and even Canvas. 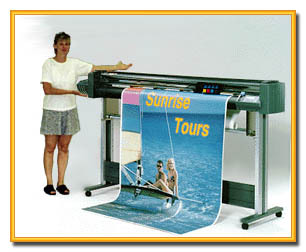 on-demand contour cutting of the printed designs in any size from 3 inches to 54 inches. Our equipment allows us to to create continuous contour cut large-format designs up to 16 meters (52 feet) long, with a resolution of 300 dpi. Photorealistic images practically jump off the page when printed at 300 dpi resolution. Some examples of projects we can do for you are illuminated displays, labels, decals, window displays, short-run posters, full-color banners, full-color vehicle graphics, full and color floor graphics much more!